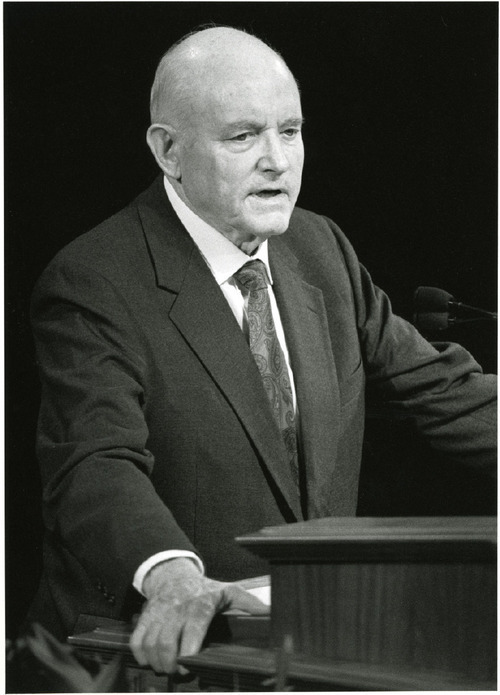 Unlike the meetings of other faiths that are more like participatory democracies, General Conference is viewed by The Church of Jesus Christ of Latter-day Saints primarily as an opportunity to preach to the assembled members. But the Salt Lake City-based church also uses the occasion to announce organizational changes, emphasize particular doctrines and respond to world events. Oct. 4, 1856 • After learning that a band of handcart pioneers was in trouble in Wyoming, Brigham Young called for volunteers during conference. They then organized a massive rescue mission to the beleaguered saints. October 1867 • The church for the first time used the Tabernacle on Temple Square for conference. 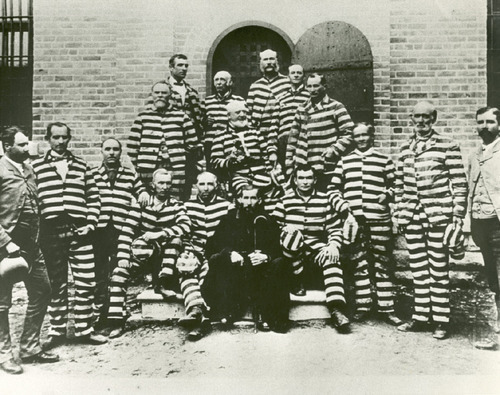 May 9, 1874 • LDS authorities proposed launching several cooperative communities known as the United Order throughout the Utah Territory. April 6, 1877 • Conference took place for the first and only time in St. George, where LDS leaders dedicated the just-completed St. George Temple. April 6, 1880 • During the church's jubilee (50th-year) celebration, LDS authorities announced the dismissal of half the debts owed to the Perpetual Emigration Fund Co., which had helped new converts make the trek to Utah. Oct. 6, 1890 • Members voted to approve "the Manifesto," a document written by President Wilford Woodruff ending the church's official endorsement of polygamy. April 6, 1893 • Leaders dedicated the Salt Lake Temple some 40 years after construction began. 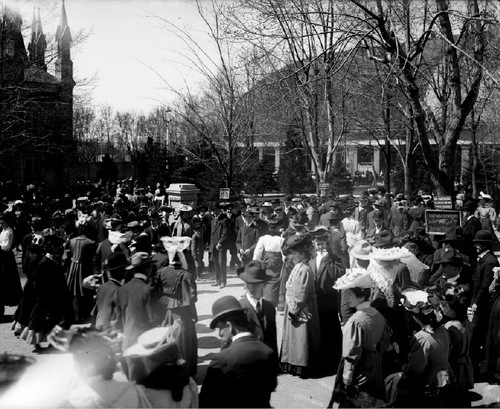 April 6, 1917 • As the 87th General Conference got under way, the United States declared war against Germany as it entered World War I.
April 1919 • A worldwide influenza epidemic postponed the gathering. Oct. 3, 1924 • Local radio broadcast conference for the first time. April 6, 1930 • The church celebrated its centennial in part by publishing B.H. Roberts' multivolume History of the Church. April 9, 1932 • In a speech primarily about the church's health code known as the Word of Wisdom, Elder Stephen L. Richards said he feared "fanaticism, rigidity of procedure and intolerance" more than he feared "cigarettes, cards and other devices the adversary may use to nullify faith and kill religion." 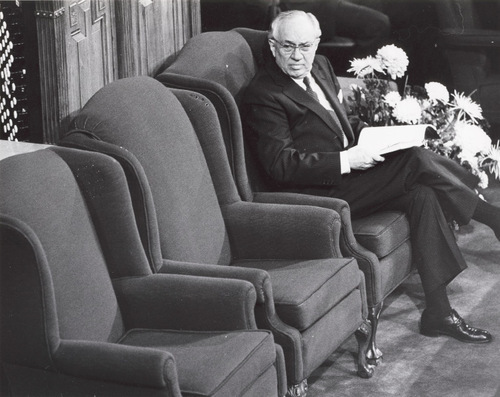 Richards' speech reportedly was the only conference address in history that wasn't published. April 1936 • The church introduced the system of emergency aid and self-help that would become its far-reaching welfare program. 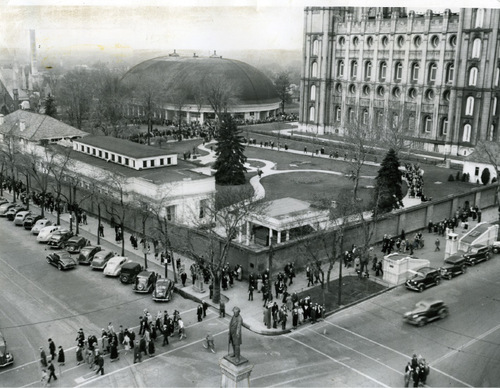 April 1942–1945 • Due to restrictions on gas and auto travel during World War II, General Conference was closed to everyone but LDS general authorities and stake presidents. October 1949 • First television broadcast of the proceedings. April 1957 • First Presidency announced plans to move Ricks College from Rexburg to Idaho Falls, Idaho. But after major opposition from local members, the church later reversed the decision. April 6, 1959 • President David O. McKay coined the still-oft-quoted slogan "every member a missionary." Oct. 3, 1975 • President Spencer W. Kimball announced the creation of the First Quorum of the Seventy. 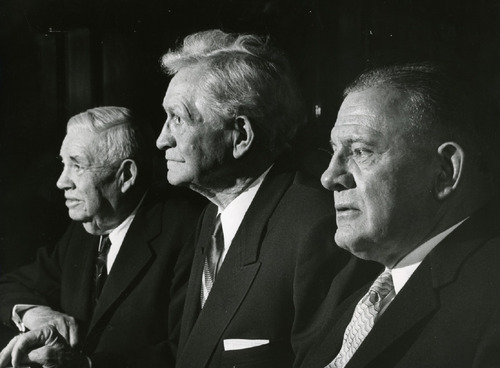 April 3, 1976 • Members voted to accept Joseph Smith's "Vision of the Celestial Kingdom" and Joseph F. Smith's "Vision of the Redemption of the Dead" as scripture. 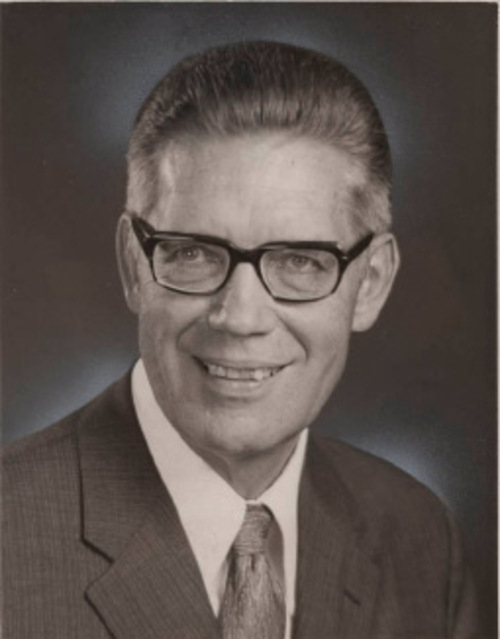 Sept. 30, 1978 • Members voted unanimously to accept Kimball's revelation that all worthy men would be eligible for the church's all-male priesthood. Until then, the LDS priesthood barred those of African descent. April 6, 1980 • Kimball celebrated the church's sesquicentennial (a word he had trouble pronouncing) by broadcasting General Conference from the newly restored Peter Whitmer farm in Fayette, N.Y., where the LDS Church was founded in 1830. April 2, 1981 • Leaders reduced the term for full-time male missionaries from two years to 18 months. The term reverted back to two years by 1984. October 1982 • Leaders announced the addition of "Another Testament of Jesus Christ" as a subtitle to the Book of Mormon. 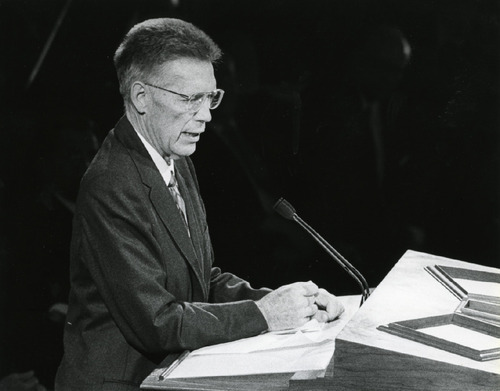 April 1985 • Elder Bruce R. McConkie, whom some considered the church's premier theologian, gave his electrifying final speech, "The Purifying Power of Gethsemane." He died of cancer two weeks later. April 1988 • President Howard W. Hunter, recently recovered from surgery, lost his balance for a moment while speaking and fell backward, landing on his back. He was pushed back into place by apostles Thomas S. Monson, Boyd K. Packer and a church security guard. Despite breaking three ribs in the fall, Hunter continued his sermon without missing a word. 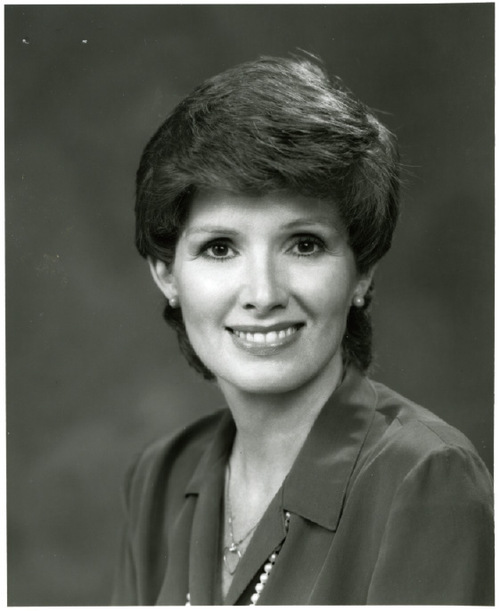 Oct. 2,1988 • Michaelene P. Grassli, general Primary president, became the first woman in 133 years to speak in General Conference. April 6, 1996 • Hinckley announced construction of a giant auditorium, eventually known as the Conference Center, in downtown Salt Lake City, to replace the Mormon Tabernacle as the home of the semiannual meetings. Oct. 4, 1997 • Hinckley proposed the building of more, smaller temples, fondly known as "minitemples," to meet the needs of members in far-flung regions. April 2001 • Hinckley announced the creation of a loan program, the Perpetual Education Fund, to help young Mormons across the globe. October 2001 • Hinckley announced to the assembled saints on Sunday morning, "I have just been handed a note that says that a U.S. missile attack is under way," indicating the beginning of the war in Afghanistan. April 2005 • After Pope John Paul II died on Saturday of General Conference, Hinckley issued a statement calling the Catholic pontiff "an extraordinary man of faith, vision and intellect, whose courageous actions have touched the world in ways that will be felt for generations to come." October 2007 • Hinckley used his cane to "knight" Henry B. Eyring, his newly appointed second counselor in the governing First Presidency.